This cup holder is suitable to all kinds of water bottles, beverage bottles, baby bottles, coffee cup, etc, saving you from the hassle of holding cups all the time. It is 360 degree rotation allowed, making it limitless to wheelchair type and compatible with most baby stroller. Clip it to any angle you prefer and adjust it according to different strollers. Also it is very easy to install and get ready, no extra tools needed. It fits to most baby stroller, pushchair, bicycle, umbrella car, bike and mountain bike, no need to worry about match issue before order. Order soon with no regrets! Convenient holder: Secure way to store child's drink on baby stroller. Spare your hands and provides quick access to water bottles. Universal tool. 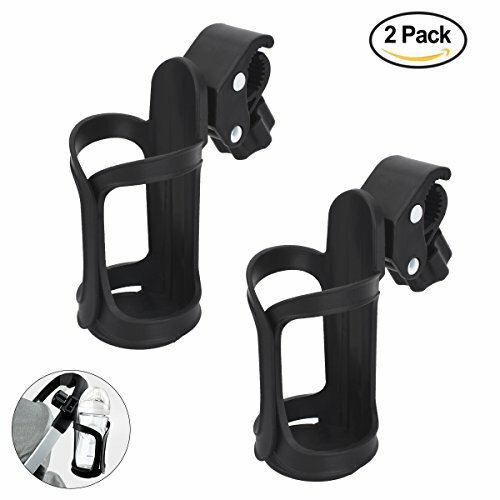 This bottle holder fits to all kinds of water bottles, beverage bottles, baby bottles, coffee cup, etc. Wide application. This cup holder is perfect for most baby stroller, pushchair, bicycle, umbrella car, bike and mountain bike. Easy to install. It is simple to install with no other tools needed, which can be fixed on straight tube, horizontal tube or oblique tube: handlebar, under seat, down tube, front pipe and more. 360°rotation. The rack is allowed to rotate in 360 degree, which make you could clip it to any angle you prefer and adjust it according to different strollers and also makes it easy to put and take your bottle.